It used to be my experience that you could almost guarantee some sort of free vehicle upgrade when you rented a car, regardless of the company you used or if you had status with the car rental agency. This was typically because I booked the cheapest car (as I suspect most people also did) and when I showed up to get my car, they would inevitably be out of that vehicle size which meant a free upgrade. I have found more and more that car rental agencies are becoming more adept at actually having the vehicle you requested available for rent and are almost always never willing to upgrade you for free. That’s when status with a car rental agency comes in handy. Not only is it usually much faster to get in and out with your rental, you also heavily increase your chance at a nicer vehicle. I’ll be the first to admit that this really only benefits people that have stayed a significant amount of time in hotels because you need to be either Platinum or Platinum Elite with Marriott or Platinum or Platinum with Ambassador with SPG in order to qualify for the status match. Your status level with Marriott/SPG will determine what status you will receive from Hertz but it will either be Five Star or President’s Circle. What Does Hertz Status Get You? With Hertz Five Star or President’s Circle status, you receive two major benefits and one minor one. The first is that you have access to the Gold Rewards or President’s Circle parking stalls. Why this is important is that it allows you to simply flash your driver’s license to the attendee, grab your keys and go. No unnecessary paperwork, having to decline insurance, etc. Just go. Personally I detest waiting for an hour at the car rental agency. This benefit circumvents that issue. The second benefit is that you are provided a one-class upgrade which is based on availability for Five Star members and guaranteed for President’s Circle members. 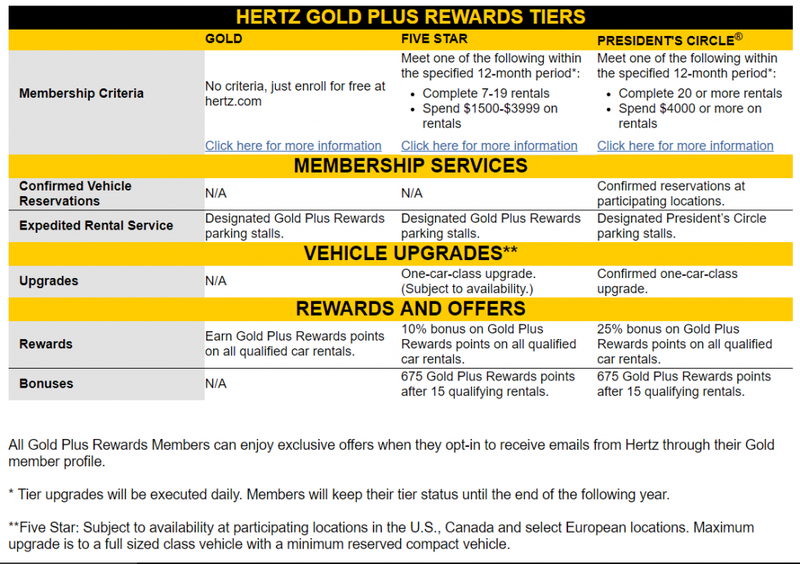 The third benefit, which I deem to be fairly minor, is a higher earning rate for Gold Plus Reward Points, Hertz’s loyalty program. If you are a Marriott or SPG Platinum Level (or higher) member, simply go to https://mrhertzstatus.com/MemberStat to register. You will need your Marriott/SPG number as well as your Hertz Gold Rewards Number. If you do not have a Hertz Gold Rewards number, you can register for one at https://www.hertz.ca/rentacar/emember/rewards-overview/loyalty-free-travel-program. Once you filled out the form, you will receive a confirmation that you have successfully registered for the status match. You should see your new status within 5 business days of registration. What If You Aren’t Marriott/SPG Platinum? Well, you’re in luck. If you hold an American Express Platinum card, you also receive Hertz Five Star status as part of your benefits. While the Hertz benefits are certainly not something that I would call a driving force to get the AMEX Platinum, it is definitely a nice throw in with the card. I always advocate that people register for every promotion, benefit and status match possible as you never know when it might come in handy. I NEVER stay at Best Westerns but I found myself booking the Best Western in Port Campbell on the Great Ocean Road in Australia because there wasn’t really much choice. Because I had registered for an easy status match with Best Western, I received free breakfast. While not earth shattering, free is free. 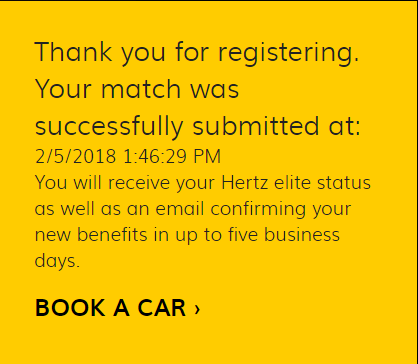 If you qualify, I would highly recommend you complete the status match with Hertz because … you never know. PointsNerd is dedicated to teaching you how to Travel Hack and explore the world in luxury for the cost of an economy ticket.